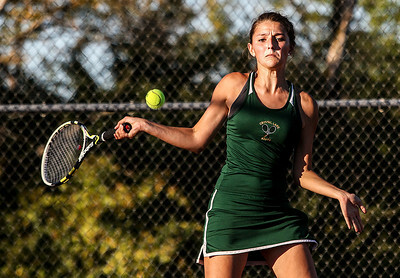 Sarah Nader- snader@shawmedia.com Crystal Lake South's Julia Thome returns a ball while competing in a singles match against Prairie Ridge's Callie Schmit in Crystal Lake September 26, 2013. Sarah Nader- snader@shawmedia.com Prairie Ridge's Callie Schmit returns a ball while competing in a singles match against Crystal Lake South's Julia Thome in Crystal Lake September 26, 2013. 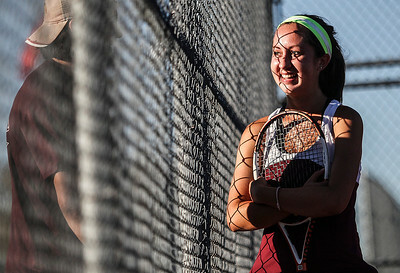 Sarah Nader- snader@shawmedia.com Prairie Ridge's Callie Schmit talks with her coach in-between tennis matches at Thursday's tournament against Crystal Lake South in Crystal Lake September 26, 2013. 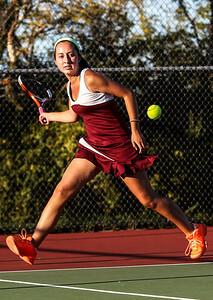 Prairie Ridge's Callie Schmit returns a ball while competing in a singles match against Crystal Lake South's Julia Thome in Crystal Lake September 26, 2013.